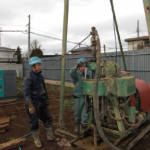 HM-DP3000 geotechnical drilling rig is a deep core drilling rig with complete functions. It’s suitable for the small, big diameter hole core drilling and alloy, diamond core drilling, exploration and geological drilling, and construction projects, water power engineering project, high way, railway and port, etc drilling projects. 1. HM-DP3000 geotechnical drilling rig adopts pneumatic shifting, branded “Fast” 8JS118 auto gear box cluth, and soft shaft block mechanism, which could achieve remote control of transmission shift, the forward gear could reach 8 grades, and reverse gear 1 grade. The parts could be universally used. 2, Low speed big torque, max torque is 12500 N.M, the rig could be easily disassembled. 3,Patented lubricating mechanism and hydraulic system cool device are adopted, which could avoid excessive heat on the parts caused by high speed and high load operation. 4,The six party vertical shaft is replaced by involute spline vertical shaft, the load output could be increased multiply times. The spindle diameter is 96mm, double cylinders hydraulic feed stroke could reach 1000mm, this makes the rig specially suitable for big diameter rods, wireline core drilling capacity depth could get 2200m. 5.Use double gear pump which can supply oil in parallel and in series to ahieve less power consumption, lower oil temperature and better reliability for different load case. And there is manual pump in hydraulic system to for jamming case.